As it was with The Hammer Of Retribution Ogg-Cast, it appears I must once again justify why I spend so much time on something that isn't some worthy cause like saving the world from yet another war, marching through the streets chanting rehearsed slogans about how nasty the English Defence League are, or campaigning for the Green Party. I will attempt to do so here, though I'm sure those who weren't convinced before still won't be afterwards. Minecraft was something I'd heard of many months before I took it up myself, and it seemed to be associated with geeks and goths the way I'd thought Livejournal was circa 2003. But history looked certain to repeat itself after I found myself round a friend's house and saw the game right in front of me - a world made of strange and vastly different blocks that looked almost like it had come from a different gaming era. Wait a minute, I thought, isn't this some kind of... electronic Lego? Maybe I should give it a go after all, I mean, it looks harmless enough. But the graphics are terrible, they say! I remind you all, I started my gaming days on a ZX81. No sound, no colour, and the "graphics" were mostly the computer's in-built ASCII characters - capital letters only - with some very blocky quarter-character-square blobs. But still, the finest programmers of the day managed to make some absolute crackers with the painfully limited machine, such as 3D Monster Maze. The Spectrum upped the ante in 1982 with sound, colour and user-definable graphics - but soon the restrictions of the character-square graphics and the standard character set were overcome and we had such brilliantly-conceived games as Quazatron (in 1986), convincing recreations of coin-ops such as Rainbow Islands (1987), and ingenious workarounds to the Spectrum's seemingly inviolable limitations, such as Buzzsaw (as late as 2011): "this game absolutely refuses to obey the 'two colours per character square' rule that defined the look of Spectrum games since time began. Had Jason Railton released this in 1984 he would have either been revered as a programming god, or burned at the stake as a witch." Throw in the lesser but not insignificant contributions to my gaming history from the NES, SNES, Atari ST, Game Boy and others I've touched on briefly via emulation that span my entire life, and I've watched a graphical evolution unfold in front of me that means I have no problem with the way Minecraft looks; it also means I know why it would never have been possible to do what Minecraft does back in the days where the graphics were necessarily that square. Never mind that, this is clearly a game for kids, they say!. Yes, I know, I said it was like electronic Lego, which we probably all had when we were in single figures (and I deeply pity those who didn't). And yes, I know, there are enough kids who play Minecraft that there has been this inexorable rise of YouTube celebrities such as stampylongnose who rakes in the cash from monetising his videos because he aims it all squarely at the under-tens. But consider, if you will, why I started playing in the first place; the first YouTuber I watched was the original teacher, the one who not just taught me how the game worked, how to survive my first night and how to build all manner of wonderful tools, weapons and the odd bit of machinery - he taught everyone in the early days. Paul Soares Jr.'s How To Survive And Thrive series originally started as far back as the days of Alpha, when there was no guide at all on how to play the game, either the wiki or with tutorial videos, so he took it upon himself to make them. And he was no youngster, he was in his late thirties (and now well through his forties) with a full-time job fixing other people's computers, a wife and three kids, all of whom participated in his adventures at various points; his youngest son was at least in double figures when Minecraft Alpha was first launched, so we're not talking toddlers here. After watching the first few episodes of the series I've linked to that covered Minecraft 1.0 to 1.7, that's when I decided to hand over my cash to Mojang - so depending on your point of view, you can credit or blame Paul Soares Jr. for my three and a half years of Minecrafting so far! Since then I've gone on to discover the age range for Minecraft varies from kids in single figures whose parents heavily restrict their computer use, right up to people in their sixties or beyond who have retired and find it keeps them amused far more than knitting or bingo ever could. And spanning a fair bit of this age range are more of the YouTubers I've come across - such as two amazing redstone contraption developers from my shores, Mumbo Jumbo (born 1995, as revealed in his "party popper" video when he turned 18) and xisumavoid (age unknown, but probably about the same); then there's a couple from the USA I keep referring to, the ridiculously talented Tango Tek whose machines are far too large and intricate for me to build, and NimsTV, "a 20-something" whose machines I can build, and have - though usually with a few tweaks. And then, bringing some German engineering to Minecraft are the Zipkrowd - usually it's docm77 (you can work out how old he is as there's a clue in the username) and JL2579 ("oversizing at the borderline of legitimate vanilla survival gameplay"), who develop brilliant new concepts, usually within hours of a new snapshot being released (such as the all-new gold farm developed the same day that a snapshot allowed the Nether portals to be expanded from 5×4 to 23×23). But no user has captured my attention quite like my favourite somewhat-squeaky-voiced Australian, Dataless822, whose videos I have been watching avidly since discovering his tutorial on how to make an item filter in the early days of version 1.5. I watched as he built insanely large machines legitimately in survival, I lost count of the number of times he'd say "holy smokes", "far out" and "Data, you fruitloop" during a single episode, and laughed like a drain as he teamed up with his bestest bud from Kentucky, Mr_Red_Dragon, who would push him off a cliff or into a pit of lava for the fun of it, and there would be Data Rage, and the inevitable revenge. 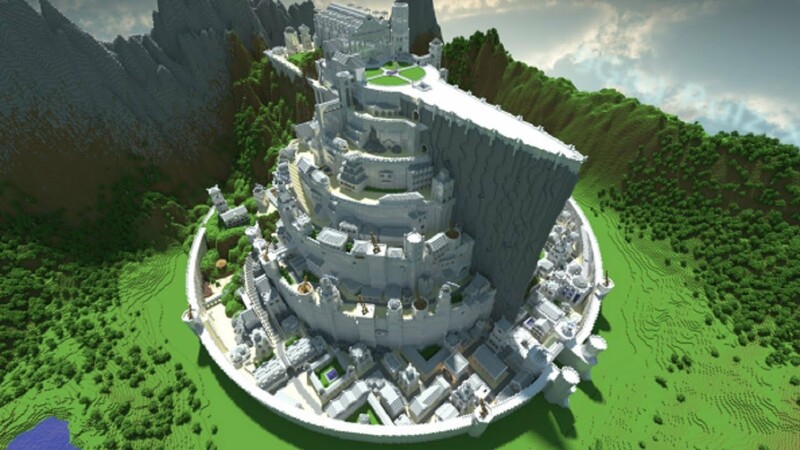 It's all made me realise that Minecraft is a game where the possibilities are genuinely limitless. Even though there are non-renewable resources, when the world has a maximum area of 3.6 × 1015 m² (or approximately seven times the surface area of the Earth), for practical purposes, nothing will ever run out. So from what's available, it's possible to build, say, the Taj Mahal, or Bucharest's Palatul Parlamentului, without the many, many fatalities involved in the real thing. Or, for a more sci-fi approach, there's the Battlestar Galactica, or the Starship Enterprise. For a game within a game, there's a determined attempt to recreate the Hyrule map from the original 1986 Legend Of Zelda - which even works the same way as the original game. And, for those involved in epic fantasy worlds, I give you some Middle Earth builds: Minas Tirith (better shown in this screenshot), Rivendell (presented with a bright and elvish resource pack), and the deep, dwarven city of Erebor (though what they'd make of that cinematic view is anyone's guess). For the big one, though, we turn to A Song Of Ice And Fire, where there's a massive project to build the entire continent of Westeros - which, according to sources close to George R. R. Martin, is supposed to be about the size of South America. Watch and gasp in amazement. Even that isn't the end of it - for where there is the Technic side of Lego, there is the redstone side of Minecraft. Never mind just getting things to switch on and off and move at will, it's entirely possible to build logic circuits which, when built up to the size of the Lord Of The Rings projects, will end up as a working computer. The specs aren't what you'd call impressive - 256-byte ROM, 32-byte RAM and a clock speed of 0.25 MHz - but remember, it's a virtual build entirely housed within another computer game and who knows, maybe it will raise the interesting possibility of building a completely virtual Sinclair ZX81 that we all know can be used to control a nuclear power plant! Meanwhile, you can also learn about physics, space and time via the creation of the single most pointless machine ever, which will open an iron door after the heat death of the Universe. What does it all mean for me? I've never been that much of a creative person - I wasn't that good at writing stories and was utterly hopeless at art, wondering how sculpture was even possible - but here I am, building and decorating and proving that my creative spark isn't quite as dead or even as limited as I might once have thought it was. But above all, since the near total destruction of my social life this decade, Minecraft has ensured that I haven't missed it; I no longer care even slightly if I'm stuck in my house on a Friday night instead of going out to the same pub with the same people doing the same things and being coerced into forced enjoyment purely because of what day it is - it's more likely I'm happier building something even as the clock strikes midnight, I'll keep on building, and before I know it, the sun is rising outside... late, because it's the middle of winter. So don't tell me I'm wasting my time. The time you enjoy wasting is not wasted time.